Bachelorette party invitations. Bachelorette and Lingerie Party invites. 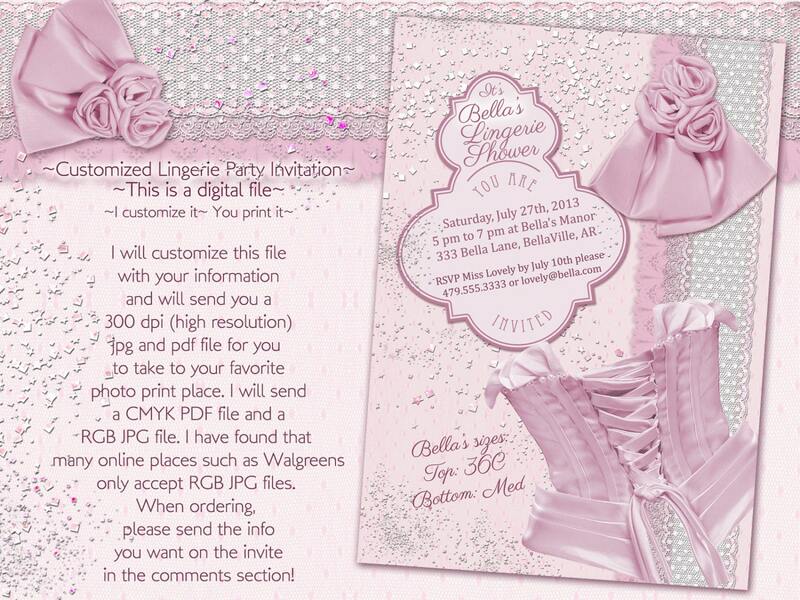 Corset invitations. DIY printable invitations. Custom invitations. I customize it ~ you print it! This is a 5x7 or 4x6, 300 dpi (high resolution) digital file that you can customize to fit your needs. It is a front design only. Just be sure when you are ordering to include all the information you want on it. Please let me know the size, 5x7 or 4x6. Also, let me know how or where you plan on printing this file. You simply let me know what you want the card/invite/note to say and I will customize it and email the finished file to you. You will not receive an actual invitation, you will receive a graphic file only. I will send a jpg file and a pdf file. The JPG will be in RBG and the PDF will be in CMYK, please let me know if you need otherwise. I have recently learned that places like Walgreens online will reject CMYK JPGs - they must be in RGB mode. You can then take it to your favorite place to print, or use an online print source and upload your file and you are good to go. PLACES TO PRINT! Walgreens online is a great resource. You can print as few or as many invites as you need. Check out below for other options.